260 Clarendon (99-107 Commonwealth) is located on the NW corner of Commonwealth and Clarendon, with 65 Commonwealth to the east, across Clarendon, 109-111 Commonwealth to the west, 270 Clarendon to the north, across Alley 424, and the First Baptist Church to the south, across Commonwealth. 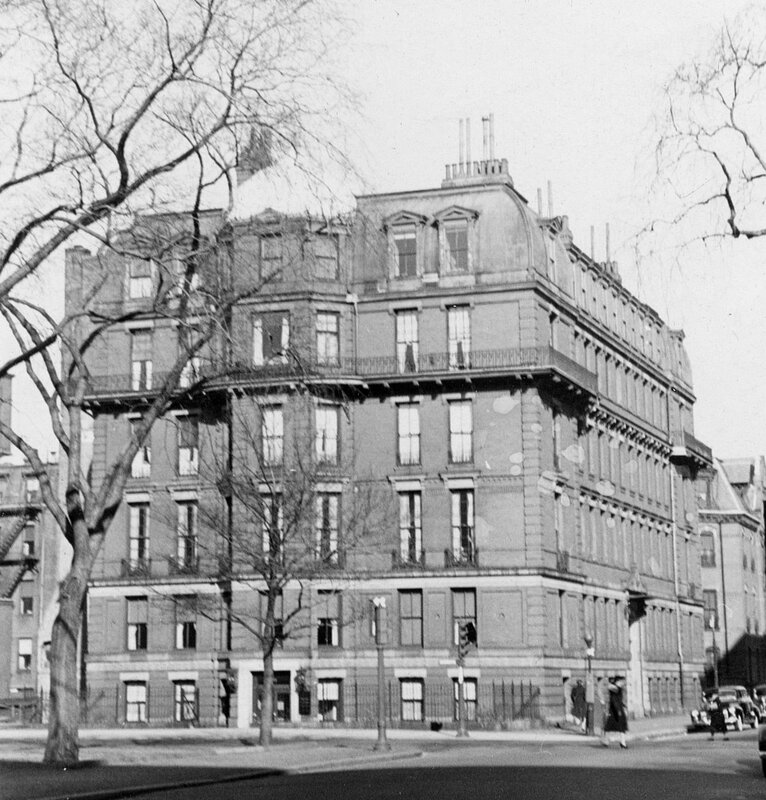 The Clarendon Street Playground is located at the northwest corner of Commonwealth and Clarendon on the former sites of the Hotel Hamilton at 260 Clarendon (99 Commonwealth), demolished in the late 1950s, and the Boston residence of James Murray Forbes at 107 Commonwealth, demolished in the late 1930s. In July of 1958, the Clarendon Development Company, operated by Morris Rudnick and Sheldon R. Rudnick of Brookline, acquired the property, razed the Hotel Hamilton, and announced plans to construct a 17-story apartment building on the land. The project violated the 80 foot height limit for the neighborhood, and the City’s change in the zoning to allow the high-rise was strongly opposed by the residents. In January of 1962, the property was acquired by real estate developers Robert Leventhal and Norman B. Levnthal of Newton. Later that year, they also acquired 109-111 Commonwealth, and their Beacon Construction Company proposed building an expanded project, filling the vacant lots and also replacing the existing townhouses at 109-111 Commonwealth. 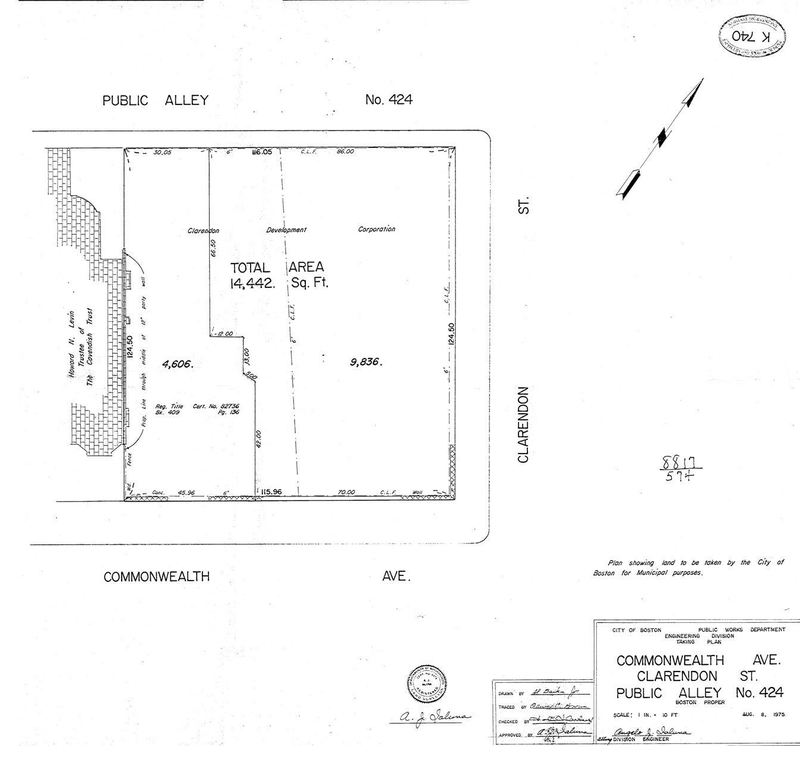 Plan of land at the northwest corner of Commonwealth and Clarendon taken by the City of Boston for use as a public park; Suffolk Co. Deed Registry, Book 8817, p. 574 (11Sep1975). After continued strong protest by neighborhood residents, the plan for the new building was abandoned. 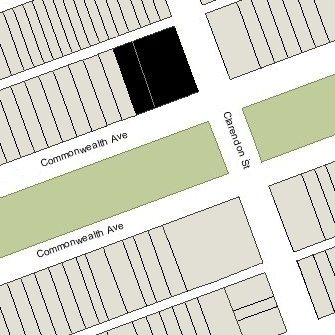 109-111 Commonwealth were not demolished and the lot at 260 Clarendon (99-107 Commonwealth) remained vacant. By the early 1970s, it had become a tot lot for the John Winthrop School Nursery School, located at 66 Marlborough. There remained, however, the possibility that the space would be used for development. 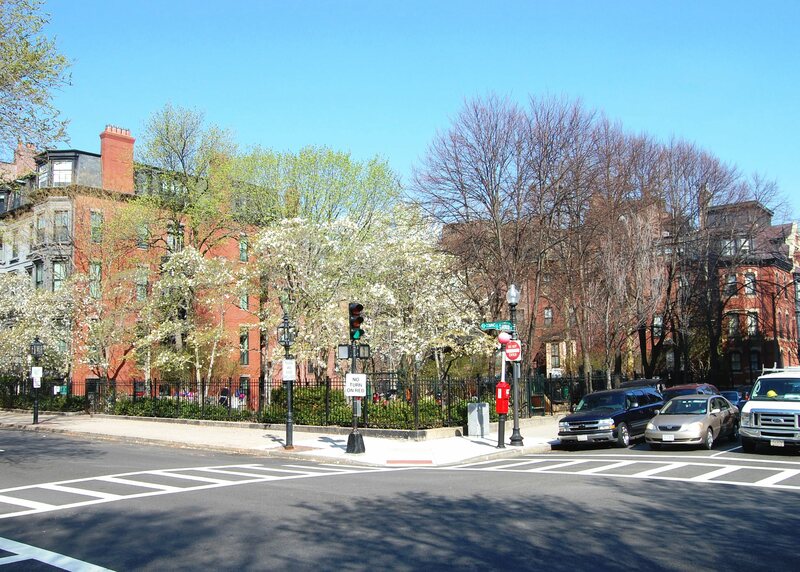 The Neighborhood Association of the Back Bay (NABB) led the effort to ensure that the park was permanently protected. It worked with the Radcliffe Institute and the architectural firms of Olmstead Associates and CBT Architects (Childs Bertman Tseckares, Inc.) to study the site and prepare plans, and held public meetings to generate support for making it a permanent park. On September 11, 1975, the City of Boston took possession of the land and the playground became part of the Boston parks system, administered by the Boston Parks and Recreation Department and known officially as the Clarendon Street Play Lot. It continues to have the active support of NABB’s Clarendon Street Playground Committee, which contributes to its general maintenance, upkeep, and renovation, and organizes various community events at the playground. Click here for an index to the deeds for the predecessor buildings at 260 Clarendon (99 Commonwealth) and 107 Commonwealth. The Hotel Hamilton at 260 Clarendon (99 Commonwealth) was designed by Ware and Van Brunt, architects, and built ca. 1869. 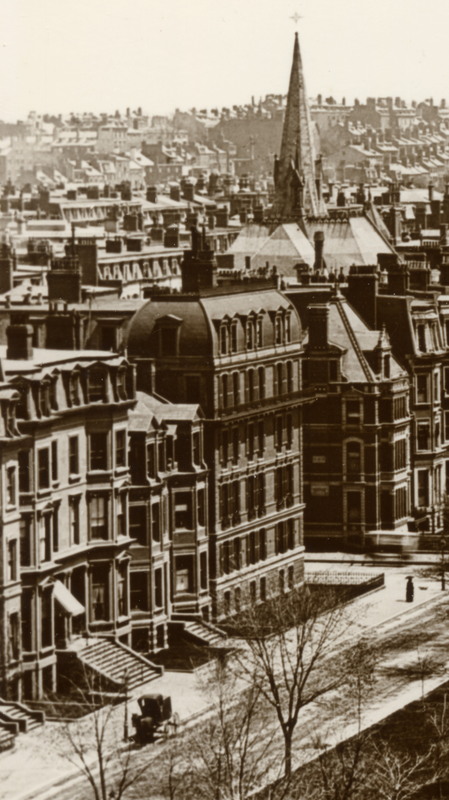 It was the first apartment building in the residential portion of the Back Bay, and it was among the earliest buildings to have an elevator. The Hotel Hamilton was built for Francis William Loring, Henry Bigelow Williams, and Robert Hale Bancroft. Francis William Loring had served in the Civil War from 1861 to 1864. He was mustered out as a lieutenant and in 1865 was promoted to the rank of Brevet Major. He was briefly an architect in Boston, but by 1868 had become a cotton broker. He was unmarried and lived at 73 Mt. Vernon. Henry Bigelow Williams was a real estate dealer. He and his wife, Sarah Louisa (Frothingham) Williams, lived at 317 Dartmouth with his wife’s parents, Samuel Frothingham, Jr., and Maria Louise (Whitredge) Frothingham. He later would develop the Brunswick Hotel ca. 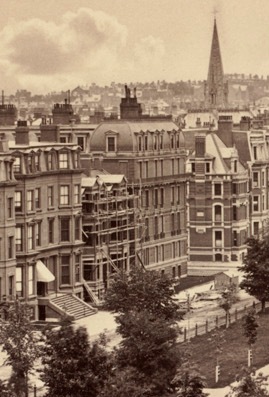 1874 at the southeast corner of Clarendon and Boylston and The Kensington ca. 1884 at 687 Boylston. Robert Hale Bancroft was an insurance broker. He was unmarried and lived at 247 Beacon with his mother, Hannah (Putnam) Bancroft, the widow of Thomas Poynton Bancroft. The Hotel Hamilton was built on a lot with a 70 foot frontage on Commonwealth. Messrs. Loring, Williams, and Bancroft purchased the land on March 1, 1869, in two transactions, a 60 foot wide lot at the corner from Enoch Redington Mudge (who had bought the land from the Commonwealth of Massachusetts on October 31, 1866), and a 10 foot wide lot to the west from Charles Thorndike (part of two lots he had purchased from the Commonwealth on June 13, 1865). On December 1870, Robert Bancroft sold his one-third interest in the property to Francis Loring and Henry Williams. 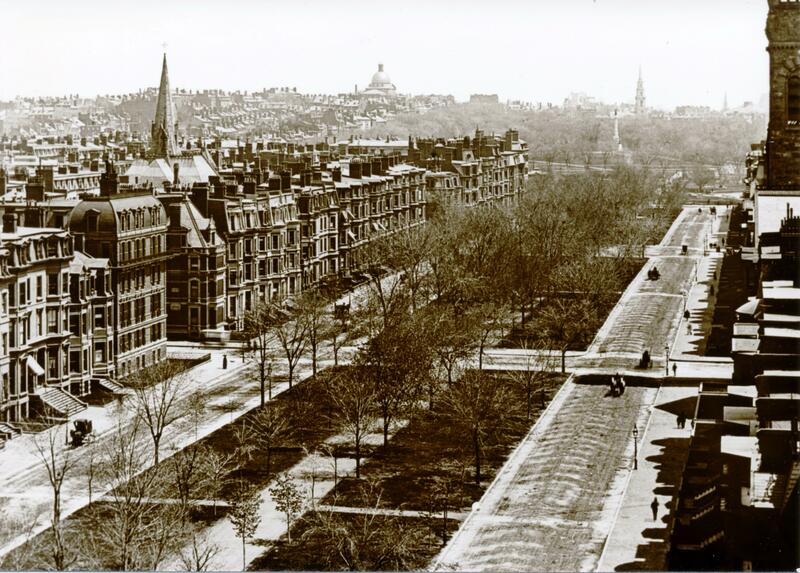 As originally built, the Commonwealth Avenue façade of 260 Clarendon was a flat plane. In the early 1890s, it was modified to include a central bay with a conical roof and a second entrance, numbered 99 Commonwealth. On July 22, 1871, Francis Loring and Henry Williams purchased remainder of Charles Thorndike’s land to the west, with a 46 foot frontage. That same month, Henry Williams’s wife, Sarah, was killed in a carriage accident. He continued to live at 317 Dartmouth with his in-laws until about 1873, when he moved to the Longwood district of Brookline. In May of 1876, Henry Williams married again, to Susan (Sturgis) McBurney, the former wife of Henry Horton McBurney. On March 23, 1876, prior to their marriage, he transferred his one-half interest in the Hotel Hamilton property to her. 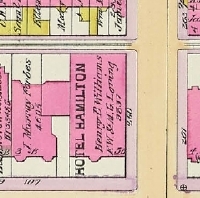 At about the same time, Henry Williams encountered serious financial reverses and on June 15, 1878, he assigned all of his property – including his wife’s interest in the Hotel Hamilton – to trustees for the benefit of his creditors (his posthumous entry in the Harvard Class of 1865 Report for 1921 notes that in 1877 “he met with grave financial disaster, from the effects of which he was not entirely free until 1905, when he paid off all his old indebtedness with 6 percent interest”). The 46 foot wide lot to the west of the hotel which Francis Loring and Henry Williams had purchased in July of 1871 remained vacant. James Murray Forbes held a mortgage on the land and in January and February of 1879, he reached an agreement with Messrs. Loring and Williams (and the trustees for the benefit of his creditors) to subdivide the lot. J. Murray Forbes acquired an irregularly shaped lot to the west where he would build his Boston home at 107 Commonwealth, and the Hotel Hamilton owners retained the remainder. They also agreed that J. Murray Forbes would not build a stable behind his house and would limit its height to three stories plus the basement, and that there would be a ten foot wide lot on Commonwealth between the Hotel and his house, running about half the way to the alley, which the owners of both properties agreed would remain open. 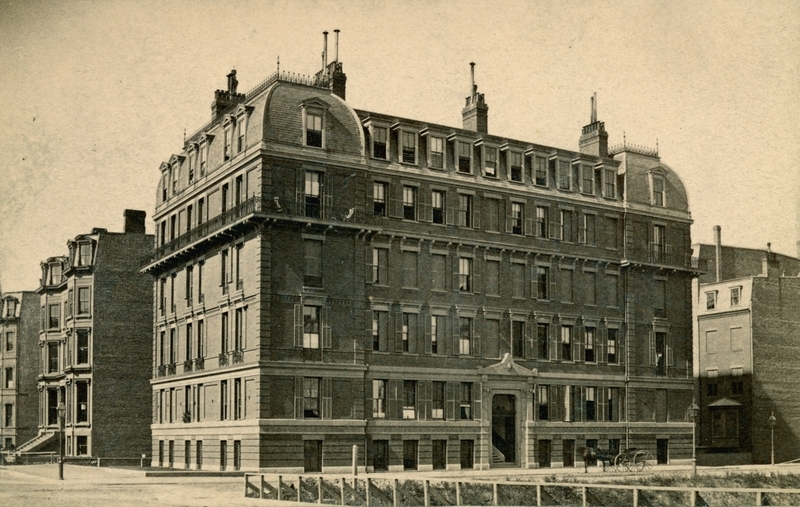 In the late 1890s, the Hotel Hamilton built an addition towards the rear of the hotel, extending to the party wall with 107 Commonwealth. The ten foot wide lot to the south remained open space, as had been previously agreed. On July 1, 1890, Francis Loring transferred his one-half interest in the Hotel Hamilton to his sister, Mary Greely Loring. On February 28, 1905, Henry Williams transferred his one-half interest to Andrew Cunningham Wheelwright, a lawyer and real estate dealer. He and his wife, Sarah Perkins (Cabot) Wheelwright, lived at 73 Mt. Vernon and Cohasset. Andrew Wheelwright died in June of 1908 and Mary G. Loring died in November of 1913. On February 12, 1914, Sarah Wheelwright acquired Mary Loring’s one-half interest in the Hotel Hamilton. On March 24, 1924, the Hotel Hamilton was acquired from Sarah (Cabot) Wheelwright by real estate dealers George Edward Cabot, Norman Winslow Cabot, and Francis Murray Forbes, as trustees of the Hotel Hamilton Trust. George Cabot and Norman Cabot were Sarah Wheelwright’s nephews (George Cabot was the son of Edward Clarke Cabot with his first wife, Martha Eunice (Robinson) Cabot, and Norman Cabot was his son with his second wife, Louisa Winslow Sewall). By the mid-1940s, the Hotel Hamilton was owned by the Shubert family of New York City, best known for their theater operations, with both Jacob J. Shubert and his son, John Shubert, elected in 1947 as successor trustees of the Hotel Hamilton Trust. The real estate firm of Cabot, Cabot, and Forbes continued to manage the property. 107 Commonwealth remained the Boston home of J. Murray Forbes until his death in April of 1937. The house was razed in about 1939 and the City of Boston subsequently took possession of the land under a tax lien. On November 14, 1945, Jacob Shubert acquired the land at 107 Commonwealth from the City. On November 9, 1950, he transferred it to 260 Clarendon Street, inc. (of which he was the treasurer), and on March 8, 1955, it transferred the property to the Hotel Hamilton Trust (of which he and his son, John, continued to be two of the three trustees). On July 31, 1958, the Hotel Hamilton Trust sold the combined properties to the Clarendon Development Corporation formed by Morris Rudnick and Sheldon R. Rudnick of Brookline. They subsequently razed the Hotel Hamilton and announced plans to construct a 17-story apartment building on the land. The project required a change in the 80 foot height limit for the neighborhood, which was approved by the Board of Zoning Adjustment in August of 1959. The neighbors challenged the decision (which allowed high-rise construction on both sides of Commonwealth from Arlington to Dartmouth and on the north side of Beacon), and in May of 1960 the Suffolk Superior Court voided the Board’s action, ruling that it was illegal “spot zoning.” Clarendon Development Corporation appealed and in June of 1961, the Supreme Judicial Court overturned the lower court’s decision. On January 19, 1962, the property was acquired from Clarendon Development by Guthor, Inc. (Rose Portney, treasurer), an affiliate of the Beacon Construction Corporation, owned by real estate developers Robert Leventhal and Norman B. Leventhal. In March of 1962, the Leventhals acquired 109 Commonwealth, and in December of 1962 they acquired 111 Commonwealth. The Leventhals proposed constructing an even larger apartment building, encompassing not only the now-vacant lot at 260 Clarendon (99-107 Commonwealth) but also the lots at 109-111 Commonwealth, which they planned to demolish. In June of 1967, they acquired 270 Clarendon through Anita R. Novins (Novinsky), an office secretary with Beacon Construction. The neighborhood continued its opposition and ultimately the Leventhals abandoned their project. On December 28, 1971, they transferred the property at 260 Clarendon (99-107 Commonwealth) to Bernard H. Rotberg, and in June of 1972, they sold 109-111 Commonwealth (which they had not razed) and 270 Clarendon to Howard N. Levin. On September 11, 1975, the City of Boston took possession of the land at 260 Clarendon (99-107 Commonwealth) for use as a public park. 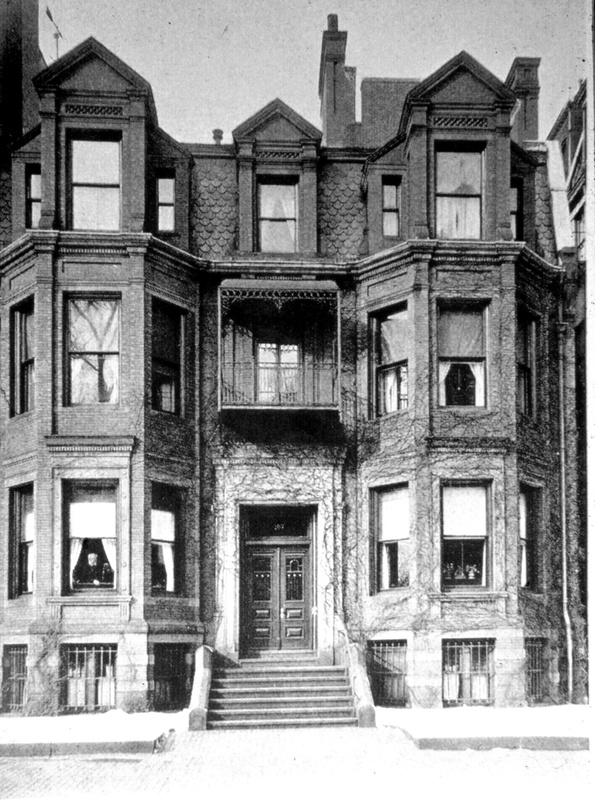 107 Commonwealth was built in 1879 as the Boston home of James Murray Forbes and his wife Alice (Bowditch) Forbes. They previously had lived at 56 Commonwealth. They also maintained homes in Milton and in Dark Harbor, Maine. 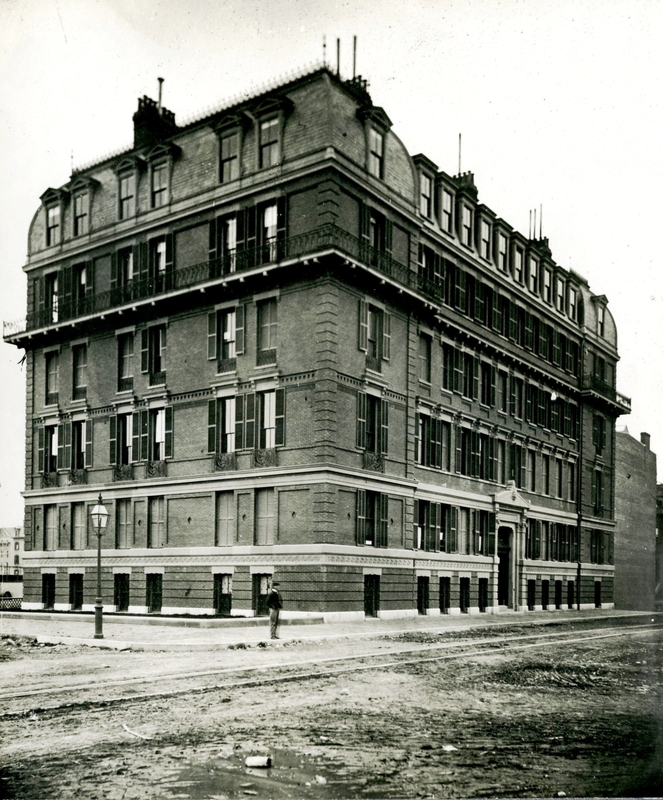 J. Murray Forbes acquired the land for 107 Commonwealth on February 3, 1879, from the owners of the Hotel Hamilton at 260 Clarendon (99 Commonwealth). It was part of a lot with a 46 foot frontage on Commonwealth which they had acquired on July 22, 1871 from Charles Thorndike (who had acquired it from the Commonwealth on June 13, 1865). Detail from 1898 Bromley map showing 107 Commonwealth and 260 Clarendon. J. Murray Forbes held a mortgage on the land and he reached an agreement with the owners of the Hotel Hamilton to subdivide the lot. He acquired an irregularly shaped lot to the west where he would build home, and the Hotel Hamilton owners retained the remainder. They also agreed that J. Murray Forbes would not build a stable behind his house and would limit its height to three stories plus the basement, and that there would be a ten foot wide lot on Commonwealth between the Hotel and his house, running about half the way to the alley, which the owners of both properties agreed would remain open. James Murray Forbes had been a partner in the China shipping merchant firm of Russell and Company, successively heading their offices in Shanghai, Canton, and Hong Kong. When he returned to Boston, he remained a senior partner in the firm and also served as officer of several investment companies and railroads, including serving as president of the Chicago, Burlington, and Northern Railroad. In 1882, he was a founder of The Country Club of Brookline, one of the oldest country clubs in the United States, the organizational meetings of which were held at his home at 107 Commonwealth. During the 1892-1893 winter season, the Forbeses were living elsewhere and 107 Commonwealth was the home of Horatio Appleton Lamb and his wife, Annie Lawrence (Rotch) Lamb. He was a wholesale dry goods merchant and later would serve as treasurer of Simmons College. They had lived at 122 Commonwealth during the previous season, and had moved to 86 Marlborough by the 1893-1894 winter season. During the 1898-1899 winter season, the Forbeses were again living elsewhere and 107 Commonwealth was the home of Henry Melville Whitney and his wife, Margaret Foster (Green) Whitney. He was a coal and iron manufacturer and president of the Metropolitan Steamship Company and the West End Street Railway Company. Their primary residence was in Brookline, where they were living once again by 1900. 107 Commonwealth was not listed in the 1900 Blue Book, but by the 1900-1901 winter season, the Forbeses were once again living at 107 Commonwealth. Alice Forbes died in January of 1929, and James Murray Forbes died in April of 1937. On July 27, 1937, 107 Commonwealth was acquired from J. Murray Forbes’s estate by Sylvia Marcus of Newton. Based on the assessment records, it appears that the house was razed during her ownership. On February 28, 1939, 107 Commonwealth was acquired from Sylvia Marcus by John J. Croke of Somerville. On July 12, 1939, the City of Boston filed a lien against the property for failure to pay taxes. The taxes remained unpaid. In 1942, it took possession of the property and on October 25, 1945, it sold it at public auction. The highest bidder was Jacob J. Shubert, and he took possession on November 14, 1945. 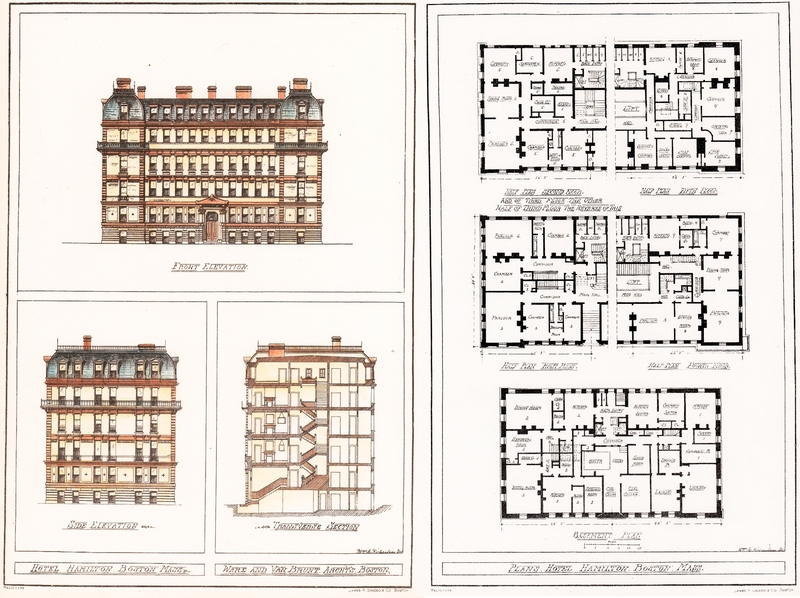 The lot subsequently was combined with the Hotel Hamilton at 260 Clarendon (99 Commonwealth).